For the thirteenth consecutive year, UBC Library and the Alma Mater Student Society are running their annual Food for Fines Campaign. From October 26 to November 9, $2 will be waived for every non-perishable food item (up to a maximum of $30). Visit any Library branch to donate items at the circulation desk. 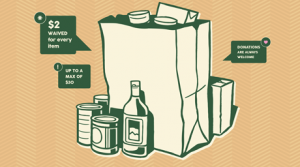 Non-perishable donations of items such as peanut butter, canned fruits and dried pasta are preferred. For a full list of the most-needed items, visit the AMS Food Bank donation website. The AMS Food Bank provides food relief for students in need, including non-perishable foods, supplies and information about additional resources on- and off-campus. Follow @AMS_UBC or @UBCLibrary with #ubcfoodforfines for campaign updates.